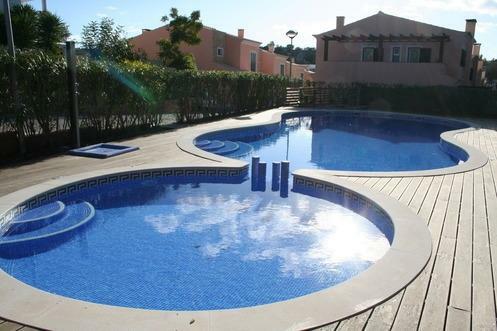 Townhouse in Albufeira, Paderne - Property for sale. Full Description: An excellent opportunity to purchase a 3+1 bed townhouse on a small private condominium in the popular village of Paderne, just 15 minutes drive from the main resort of Albufeira. With a thriving ex-pat community and with all amenities within walking distance the location is perfect for either permanent residence, long stays or quiet, relaxing holidays. The house is very spacious and the layout comprises, on the ground floor, an open plan lounge/dining room with wood burner, fully fitted and equipped kitchen with granite worktops and integrated washing machine, fridge/freezer and dishwasher, plus breakfast bar. The light airy lounge/dining room offers plenty of space for the dining table with 6 chairs, and seating area around the fireplace with wood burner. From the lounge 2 patio doors lead out onto a large private South facing terrace with additional side gated access, BBQ, plenty of seating area to admire the lovely countryside views. Further on the ground floor there is a guest w/c and an additional room currently used for storage but would equally make a reasonably sized 4th bedroom. The open plan wooden staircase leads to 3 double bedrooms with wooden flooring and feature wooden ceilings, 2 with fitted wardrobes and the master with en-suite bathroom and Juliette balcony. There is another full bathroom with Jacuzzi bath. There is a lovely communal swimming pool with childrens pool and decked sunbathing area. The condominium is accessed through remote gated entry with calcada driveway, plenty of parking spaces and is in a peaceful rural area surrounded by countryside. This lovely house is being offered furnished and equipped which should be seen to appreciate fully, viewing is highly recommended.